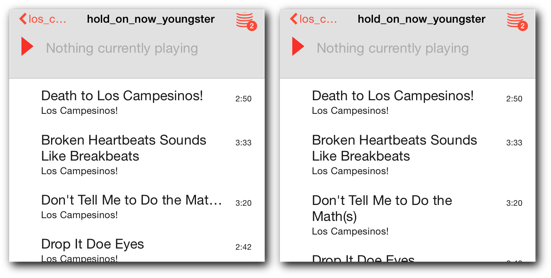 In iOS 8, it is possible to present any view controller in a popover. This blog post describes the construction of a UIControl which presents a popover menu of text options. The full code of the control, and an example program, may be found here. Sometimes, it is useful to have a popup menu in an iOS app; for the user to be able to change a value by tapping or dragging on the value and selecting a new one from a menu. Traditionally, this has been done on the iPhone with UIActionSheet; the idiom was that the user tapping on the button/table cell would trigger a pane of options, which would display from the bottom of the screen. This made sense for small phone screens, as it allowed one-handed operation, but in the age of the phablet, there is no need to stick to it. Hence, as of iOS 8, it is possible to present arbitrary view controllers in a popover on any iOS device, which is quite powerful. On the iPad, one could present arbitrary view controllers in a popover view for a while. This deliberately did not support the iPhone, and would cause the app to die with a runtime error if one tried using it. In iOS 8, Apple have changed the interface somewhat, and extended it to the iPhone. In iOS, one presents a new view controller by instantiating it, setting it up and calling the current view controller's presentViewController:animated: method. Traditionally, this has been used to push view controllers onto a UINavigationController stack, or to present modal full-screen view controllers. In iOS 8, the same method can be used to present view controllers in a popover container, which appears on the screen with an arrow pointing to the control it launched from. To do this, one first sets the view controller's modalPresentationStyle to UIModalPresentationStyle.Popover. One then obtains a UIPopoverPresentationController from the view controller's popoverPresentationController property, and uses this to configure the popover's appearance and behaviour; these include the view on which the popover is being displayed, the frame rectangle of the control it is being launched from (to which the arrow will point), and which arrow directions one wishes to use. One also needs to give it a delegate, and to make it work correctly, define the delegate's adaptivePresentationStyleForPresentationController to return .None. Then, once this is done, one presents the view controller using presentViewController:animated:. The controller may be dismissed in the same way modal view controllers are, by calling its dismissViewControllerAnimated: method. The controller will also be dismissed if the user taps outside of the popover; if this happens, the delegate's popoverPresentationControllerDidDismissPopover: method will be called. The popover menu will have one or more items, or options, each of which is a string. The popover menu will be launched when the user taps on a button. In some cases, the button will display the currently selected option, and the menu will allow the user to change this. In other cases, the menu will display a fixed prompt, and the menu will be used to trigger one of several actions. The entire control will be a UIView subclass, which contains a UIButton, and handles displaying and responding to the popover control when the button is tapped. The control keeps a list of options, and the index of the currently selected option (if present). It also has various configuration options, such as whether the button is to display the selected item title, and text to display if no item is selected, or if the selected item title is not to be shown. We want the control to send a notification when its value changes; to do this, we make it a subclass of UIControl, and allow the application to set targets to be notified on the ValueChanged control event. There are a few things to note there; rather than storing options as Strings, we have defined an enum named Option (within KFPopupSelector's namespace). Currently it has only one option, which wraps a String, but it will, in future, allow for the addition of options which consist of something other than a string. I have also chosen to define the view controller class, PopupViewController, in the control's internal namespace, rather than in a separate file; this is something possible in Swift, and as the view controller is both intimately tied to the control which launches it and fairly uncomplicated in its functionality, separating it out made little sense. Finally, we define the intrinsicContentSize method, making it return the button's content size; we want the control to hug the button, and if the button dimensions change (due to changes in its label), we want to push that out to any autolayout constraints the button is connected to. As this control is fairly compact, all of its code is inside the KFPopupSelector class; as such, all other code fragments in this article will be implicitly inside this class. Note that we call the buttonPressed: method on TouchDown, not TouchUpInside; we want to show the popover when the user touches the button, rather than when they lift their finger from it (as the normal button behaviour is). We have not defined what viewController is. However, we know that, to present a view controller, we need to do so by calling a method on the current view controller. Which is easy to do if we're doing so from within the view controller, but a tad trickier when the code is encapsulated into a UIView subclass. View controllers are a higher level of abstraction than views; while views deal with concrete interface elements, view controllers deal with the aggregation of those into specific screens or tasks; and normally, there is no reason for views to know about view controllers. However, this is one of those exceptions, in which a view needs to reach up to the higher level to present a temporary view controller. So how do we obtain this? In the viewWillAppear method, we check if the table view's contents fit within its screen space, and if so, disable scrolling (having the menu move as the user touches it would look a tad disconcerting). If the menu is too big for the popover, scrolling is enabled. Finally, when the user selects a cell, we just call the callback which was passed. So now we have the basics of the popup selector control working; when the user taps the button, it shows a menu in the popover. They can then tap an item, which will close it, set the control's selectedItem, and send out a valueChanged control event. Which is almost what we want. One more thing we'd like to have would be to allow the user to select an item with one gesture; rather than tapping the button and then tapping the item, the user should be able to put their finger on the button, drag to the item in the newly opened popover and release their finger, selecting it. As UITableView doesn't handle drags originating from outside its bounds (not to mention before it was created), we will need to do this manually; and the way we will do so is by attaching a UIPanGestureRecognizer to the control. When the drag position moves, it checks if it hits a table row, and if so, selects it; when it ends, if a row has been selected, it stores its value in the control, and closes the popover. The KFPopupSelector control, as described here, performs a simple case of wrapping a popover menu into a control; however, there is plenty of room for expansion. ...and, of course, making the appropriate changes in table view cell creation, width estimation and such. Another possibility would be to replace UITableView with UIContainerView, allowing non-vertical layouts. This would be handy if the options are images or colours, which may be laid out on a grid, or for doing horizontal menus of short pieces of text, as seen in the iOS cut/paste popover.